Please call owner Scott at 256-677-9797 or 256-822-4474. 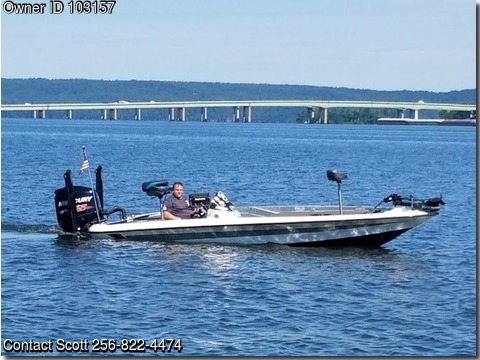 Former Bassmaster Elite boat that won the 2014 Sabine River Championship -- Loaded with Raymarine electronics, 3 screens, side & down view sonar, GPS, 3 Batteries, 3-Bank Charger, Power Poles, 3 Rod Holder Bays, Motorguide Trolling Motor, Hydraulic Jackplate, Carpet, Oxygenator, Hotfoot, Trim Tabs, Full Guages, Life Jackets, Anchor, Legally Turn Key, Professionally Maintained, Matching Tandem Axle Trailer with Custom Wheels. Custom Blue LED Lighting on Boat & Trailer. Custom Travel Cover, All Boat & Component Warranties Transferable.